This is part of a series of recipes made with only flour and water. Once, I made enough homemade dumpling dough for 40 people. It took me more than an hour of mixing, a team of 10 people rolling, and the entire evening to wrap the dumplings. If you're making dumplings for such a large group, you should buy store bought wrappers...trust me. This recipe makes enough for 50 dumplings, which is much less overwhelming. I generally eat about 15 dumplings for a meal, so this is a meal for 3 people or an appetizer for for a large group. The wrappers only need flour and water, but you probably don't want to eat them plain. Dumpling dough can be used with all sorts of fillings to make Chinese dumplings, also known as potstickers or gyoza. Meat eaters can try pork with chives or cabbage. For a vegetarian filling (complete recipe coming soon! ), stuff dumplings with tofu, seitan, mushrooms, etc. If you're feeling ambitious, grab a friend and set aside an afternoon to make a batch of homemade dumplings. Having one person roll the dough and the other person wrap the dumplings makes the process go by much faster. Mix together the flour and water until it forms a cohesive dough. Let the dough rest for at least 10 minutes or overnight. Form the dough into a circle, and cut into 8 equal wedges. With your hands, form each wedge into a cylinder, and cut into 6-7 pieces. Using the rolling pin, roll each piece into a circle about 3-4 inches in diameter. Lightly flour the homemade dumpling wrappers so they don't stick to each other, and lightly cover with a damp towel so they don't dry out. Use the wrappers immediately to make dumplings. Dumpling dough uses the same ratio of flour to water as homemade crackers. If you find that the dough is too hard to roll out, you can always make eggless pasta instead. Similarly to scallion pancakes, you can make the dough with water at any temperature. Cold tap water is most convenient. Cold water dough is chewier, and hot water dough is more tender. You can change water temperature based on how you plan to cook the dumplings. If you're boiling the dumplings, cold water dough would hold together better. If you're steaming or pan-frying the dumplings, hot water dough would hold for these gentler cooking methods. If you're using store bought wrappers, make sure to thaw the package ahead of time. 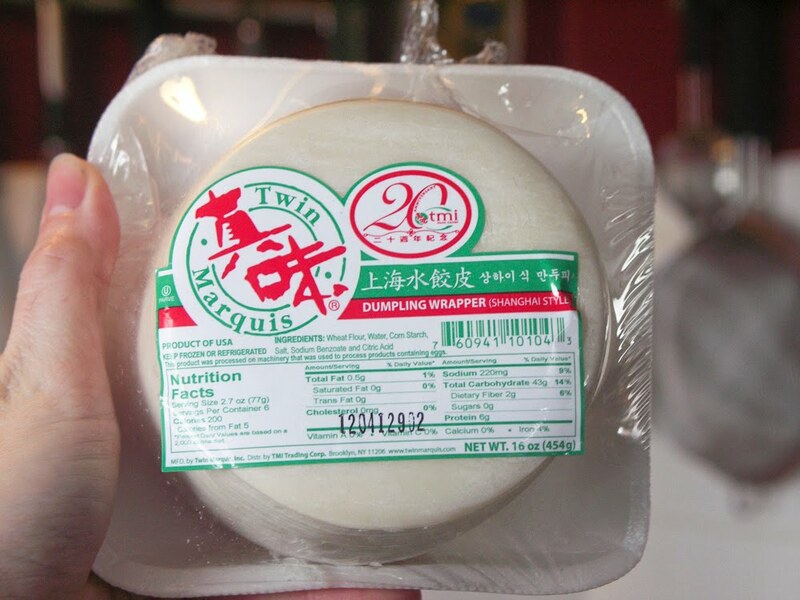 A standard package of dumpling wrappers and this recipe for dumpling dough both make 50 wrappers. To confirm this fact, compare the total caloric content. The package of dumpling wrappers has calories. Flour has 100 calories per 1/4 cup for calories. Mix together the flour and water until it forms a cohesive dough. If there are any small flour clumps at the bottom, add in a teaspoon of water at a time until all incorporated. Let the dough rest for at least 10 minutes or overnight. Knead the dough to help it come together. The dumpling dough should be fairly smooth and supple. Form the dough into a circle, and cut into 8 equal wedges. With your hands, form each wedge into a cylinder, and cut into 6-7 pieces. I managed to end up with exactly 50 pieces, but you don't need to be terribly precise. Using the rolling pin, roll each piece into a circle about 3-4 inches in diameter. You'll want to lightly flour your working surface every now and then to prevent sticking. For a nice circle, flatten each small piece into an even disk and roll. You might make a few Australia wrappers, but you'll get the hang of it with practice. It took me 5 minutes to roll out 1/4 of the dough to make about 12 dumpling wrappers, so the total rolling process should take 20-25 minutes. The dumpling wrapper should be fairly thin. Unlike with a store bought dumpling wrapper, you do not need water, and you can press together the dumpling dough to seal the dumplings together. If you don't flour the homemade dumpling wrappers, they will stick together, and you won't be able to separate them. As a result, you have to reroll the dough all over again. Don't be like me. To prevent this, lightly flour the homemade dumpling wrappers, and spread them farther apart. Also, lightly cover with a damp towel so they don't dry out. Use the wrappers immediately to make dumplings. It works really well if you have two people, and one person cranks out wrappers while the other wraps the dumplings. I found your site yesterday and thought, okay, I'll bite (lol) and went through a few of your Flour and Water recipes. I'm very impressed! You remind me of a modern Fanny Farmer. With these dumplings, I made a filling from potatoes, spinach, onions, and olives. My husband thought they were "gooey" (I believe is what he said) so after I steam/boiled them in an electric skillet, I browned them. Excellent! I made way too many for the two of us so I stuck them in the fridge for the night, and now I have a fabulous cold dumpling breakfast! I'm a finger-food-grazing-vegan, these are perfect for me!! And my husband's liking them a bit crisped. Wow thank you. The economy makes us all stretch the Buck. Good ole recipes like mom and grandma made are wonderful. Thank you..I use the dough for pizza took. My sister's allergic soy, milk, eggs, nuts, and corn it's hard to find something she'll be able to eat so I'm going to try this and the noodles hopefully she likes it thanks!